There's no doubt that the music industry is a hustle. Whether it's working two or more jobs, freelancing and working multiple roles, or working full time and then attending (or playing) a show, we're always moving and working. How long can we keep this up before we spectacularly crash? One of the most important things I learned toward the end of graduate school was how important it is to first and foremost take care of myself. Late nights, easy and calorie filled take out meals, and total exhaustion led to not only a 15 pound weight gain, but a loss of muscle, fatigue, and illness. Even when I was sick, I'd go to work. When I was tired, I drank more coffee and tea, and still went to bed late. It wasn't until the end of graduate school that I realized the havoc I had wreaked on my body and my mental health, and I knew that going forward, no matter how busy I was or how many deadlines were approaching, I needed to take care of myself first. Self-care means something different to each person because not only is each person different, but each person takes pleasure in different things. I went through a spectrum of different self-care tools in the last 11 months since graduation, and I'm still experimenting with different techniques that calm me, create space in my mind, and allow me to be healthy. There are several, however, that are now engrained in my daily or weekly routine, and I feel as though something is missing if I don't take the time for them. Here are a few tools and techniques I've found to have a positive impact on my life. A gratitude journal can look different to each person. From using a blank journal to write a gratitude and intention each day, to writing post-it notes and sticking them around the house, or using an app on your phone, the most important part of this is writing it down so its out there in the universe. When you can clearly see the things in your life that you're grateful for, you become more aware of them and it causes a positive shift in your mind. Writing a gratitude journal was a new process for me, so I wanted a journal to guide me through the process each day. I found the Five Minute Journal after hearing about it on various podcasts, and made the purchase almost immediately. 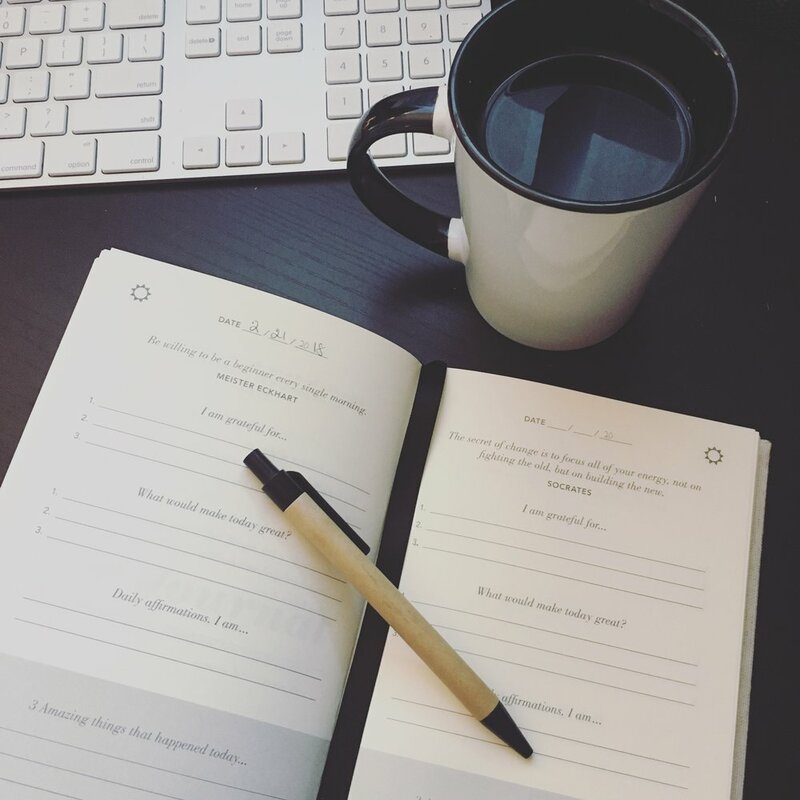 I love this journal because each day I can reflect on three things I'm grateful for, three things that would make the day great, and one to two positive affirmations of what I want in my life. At the end of the day, the journal gives me room to reflect on the good things that happened as well as ways the day could have been better. I leave my Five Minute Journal on my nightstand so it's the first thing I see when I wake up and the last thing I complete before I turn my light out at night. Reflecting on the good in my life and setting intentions for my day brings positivity to my life and allows me to set small, manageable goals to achieve. The nightly routine is a chance to reflect on what brings me joy and set goals for the next few days to become happier, healthier, and more productive. Some days I feel like have to be "on" non-stop, running from work to a workout to writing for the blog, running errands, meeting with a friend...it feels like it just never ends. For as much as my body is going, my brain is too - to-do lists at work, for the blog, for chores at home, and even lists for things I want to do for fun or to relax (seriously, I create lists for relaxation). I wasn't taking time to stop and clear my head, and it exhausted me. Guided meditation allows me to stop for 10-15 minutes, relax, and clear my head. Headspace is my go-to guided meditation app because I can choose from hundreds of guided meditations depending on my mood or what I'm looking to get away from or heal in my mind. I complete a 10 minute meditation each morning, usually after journaling, to set the tone and an intention for the day. What's great about Headspace, is that there are "singles" that are just a few minutes long to help you reset for the rest of the day. These come in handy during stressful periods at work, after (or before) a stressful drive during rush hour, or if my mind is going 100 miles an hour and I need to stop for a few moments. Taking care of my mental health is an extremely important part of my self-care routine, and is instrumental to my happiness and confidence in business and reaching my goals. My self-care routine wouldn't be complete without a few workouts a week. I'm not talking about spending hours at the gym on the treadmill or lifting weights (though I do spend at least one day a week running on the treadmill during the winter months). Fitness options are abundant in Los Angeles, and I switch it up each week by hiking, running outside, or by taking fitness classes through ClassPass. ClassPass lets me choose from a variety of classes and studios in the Greater Los Angeles area to customize my weekly workout routine. Not only is my body getting a variety of workouts, but my mind is stimulated as well because I'm not in a rut of a fitness routine. Plus, going back to taking care of mental health, those endorphins released during a fun work out are great mood boosters! What are your favorite self-care tools? Do you have a self-care tool that works for you? What does your daily or weekly self-care routine look like? How has taking care of yourself helped you achieve goals in your career or your personal life?